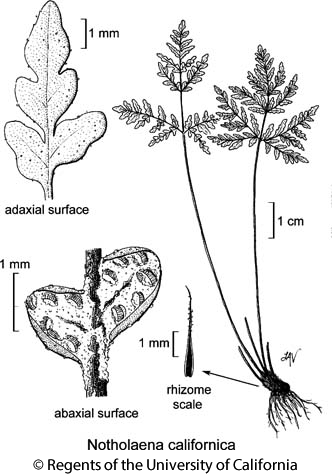 Habit: Plant in soil or granite rock crevices; rhizome short-creeping to +- erect, scales lance-linear. Leaf: stipe generally cylindric, dark brown to black, glabrous to +- scaly; blade 2--4-pinnate, segments generally sessile, +- narrower at base or not. Sporangia: in +- continuous, marginal bands; segment margin recurved, partly covering sporangia, unmodified; spores finely ridged or granular, often +- black. Habit: Rhizome scales rigid, with +- black midrib +- to margins, finely ciliate. Leaf: 3-pinnate, +- 3--13 cm; blade axes brown to black, glabrous or with white to yellow exudate; lowermost pinnae each more developed on basal side; segment abaxially covered with white to yellow exudate, hairs 0, scales 0, adaxially sparsely dotted with white to yellow exudate. Sporangia: 32-spored. Chromosomes: n=2n=150. Ecology: Dry rocky slopes, rock crevices, under rock ledges; Elevation: 200--1300 m. Bioregional Distribution: SCo, s ChI, TR, PR, DMtns, DSon; Distribution Outside California: Arizona, northwestern Mexico. Note: Apogamous. At least 2 entities in California chemically distinct: 1 with pale to bright yellow exudate on leaf abaxially (Notholaena californica subsp. californica), 1 with white exudate on leaf abaxially (Notholaena californica subsp. leucophylla Windham). Gene flow between them where they overlap geographically (s California) 0 due to apogamy, and pentaploids in Arizona suggest further study needed to decide if taxonomic recognition warranted. Synonyms: Notholaena candida (M. Martens & Galeotti) Hook. var. accessita Jeps. Citation for this treatment: Ruth E.B. Kirkpatrick, Alan R. Smith, Thomas Lemieux & Edward Alverson 2012, Notholaena californica, in Jepson Flora Project (eds.) Jepson eFlora, http://ucjeps.berkeley.edu/eflora/eflora_display.php?tid=34721, accessed on April 24, 2019. SCo, s ChI, TR, PR, DMtns, DSon; Markers link to CCH specimen records. Yellow markers indicate records that may provide evidence for eFlora range revision or may have georeferencing or identification issues. Purple markers indicate specimens collected from a garden, greenhouse, or other non-wild location.